Deciding what material to use in your application can be challenging, especially when it comes to permanent magnet materials such as samarium cobalt and neodymium iron boron. Total cost of the system. When compared to Neo, SmCo offers unique capabilities such as higher energy density at elevated temperatures. Maximum operating temperature for samarium cobalt is more than 2x neodymium iron boron. 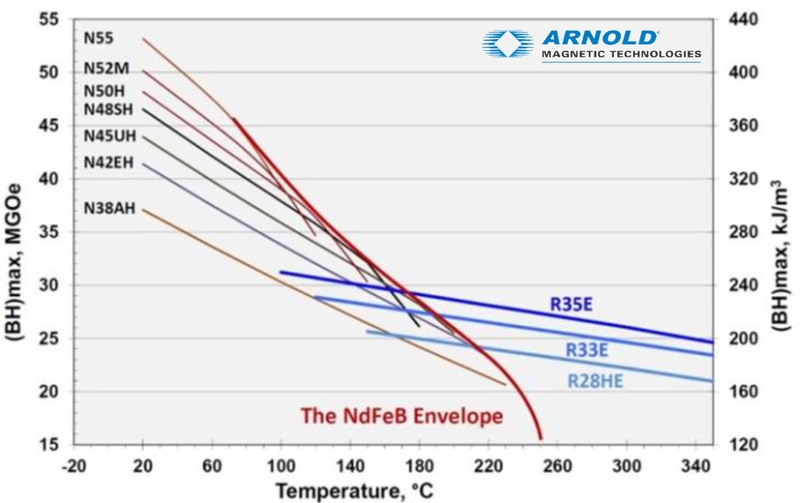 SmCo flux output varies much less with respect to temperature, meaning the device performance can truly be optimized. The chart below illustrates the energy product of SmCo vs. Neo.